The Bell Inn has recently been refurbished and now offers a first floor restaurant overlooking the Thames. 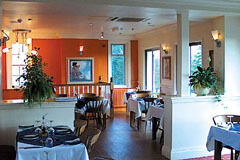 Both the bar menu, which has a selection of lighter bites through to more substantial main courses, and the a la carte menu are supported by a fantastic specials range and extensive wine list. The menus reflect our passion for freshly prepared traditional food delivered in a contemporary fashion. We call it “… english with a twist!”. Dine al fresco in our child friendly enclosed patio. Restaurant open every day noon-3pm and 6-11pm (bar food available all day). All major credit cards accepted (not Diners). No service charge. XEeljY That's a mold-breaker. Great thiinkng!